Ashley Wilda is a longtime member of the Peak community, climbs on our competitive Pro Team, and is a part of our Homeschool staff. Ashley – and the entire Wilda family – are fixtures in the gym, and brighten up our days with their cheerfulness and excitement about climbing. While she’s crushing at the Regional competition today, we wanted to share this piece she wrote about her experience climbing with her mom. To all the mothers out there, whether you’re a climber yourself, a happy belayer, or a passionate spectator – happy Mother’s Day! The first time I took my Mom on a climbing trip, I had no idea what to expect. Would she love it? Would she hate it? Will she come to understand why climbing is so special? How it’s not just another activity? Although my Mom had climbed for a little while when I had started two years before, she dropped it as her life got busier and more hectic. I knew she partially understood my passion – more like my obsession – with the sport, but I wanted to share that passion with her. I wanted her to fall in love with the movement, the puzzle, the challenge, the joy of climbing as well as the amazing community that I am proud to be part of. I was hoping that this weekend trip to the New River Gorge would reveal the down-to-earth core of climbing, much like an artist whips away a sheet to reveal a masterpiece. A couple months prior to the trip, I had been on a week-long climbing adventure to the New River Gorge with a large group of friends… and the only word I can use to describe it is magical. I came home deeply in love with the place climbers affectionately call “the New,” already itching to climb real rock again, to crank on that Nuttall sandstone. So I planned another trip with some friends, and my Mom came too. The first morning there, we headed to the Cathedral Café for breakfast, and I soon found out that it was the perfect place to meet other climbers. Guidebooks on every other table, carabiner key chains, and Rock Candy t-shirts – I found signs of climbers everywhere I looked, and it thrilled me. My Mom was impressed, especially when two climbers came and sat at our table. One of the things I love best about the climbing community is that no one’s a stranger… climbers who have just met can talk to each other like they’ve been friends for ages, and the community is fun, passionate, and down-to-earth. My Mom truly enjoyed meeting those two climbers in the café and began to meet other people on her own throughout the weekend. Soon she was introducing me to other climbers, instead of me introducing her. One of the highlights of the weekend was when Mom climbed the 5.7 Hippie Dreams at Orange Oswald wall at Summersville Lake. She fought her way up that climb, and despite many falls and a few skipped moves, made it to the top. I had never seen Mom more excited after finishing a climb. She was exhausted and had bloody scrapes as trophies of her fight, but also had a huge triumphant smile on her face. When she described the moves to me, her voice was infused with the feverish excitement of battling with yourself on the rock and winning, her face positively glowing with the joy of climbing. Although that route was the only climb Mom did that weekend, it set the stage for many others as well as for new adventures. After that short but powerful weekend, I could tell that Mom’s attitude toward climbing was different. She more fully appreciated the awesomeness of the community and my passion for climbing; she had been part of it and felt it herself, if only for a short while. I planned another trip, this time a week at the Red River Gorge in Kentucky, and Mom came too. She began climbing indoors regularly for the trip, and I could tell the difference when she climbed outside again. 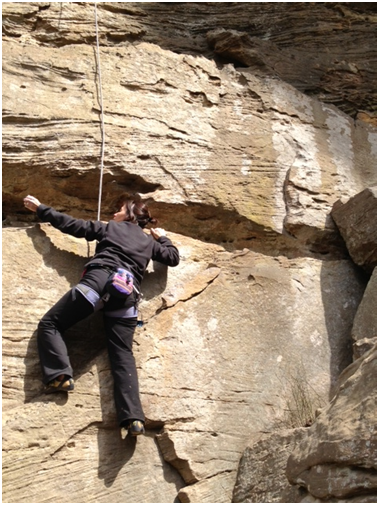 And I can tell, every time she lowers from another route, that she loves climbing even more. To my hard-core Mom: may you continue to discover the joy of climbing! 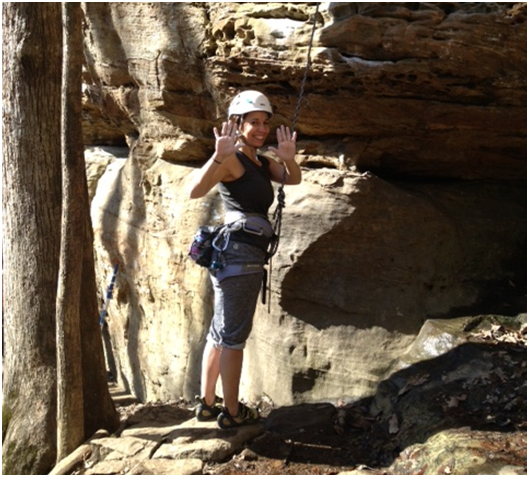 This entry was posted in Outdoor Climbing and tagged Guest Post. Bookmark the permalink.